The burrowing owl is a small owl that is found in the open fields, prairie grasslands, and desserts of the western half of North America, Mexico, Central America, South America, Florida and the Caribbean. As their name implies they live in under ground burrows. However most burrowing owls do not dig their own burrows, instead they use old burrows dug by ground squirrels, prairie dogs or other mammals. In Idaho where the photo above was taken the burrowing owls typically live in holes that are dug by badgers who are trying to dig out ground squirrels which they eat. The danger is that the badger might return and burrowing owls could be the next item on the menu. 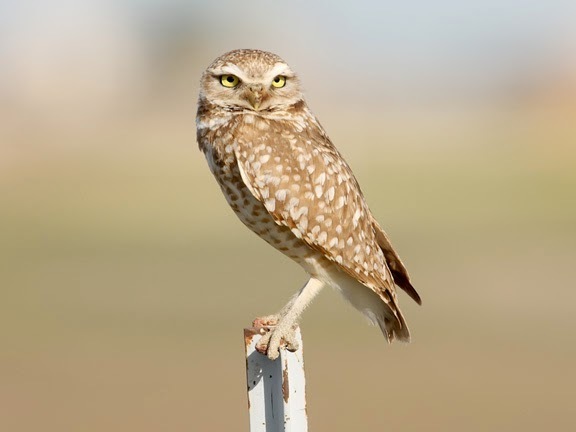 The burrowing owls hunt small mammals, such as mice and voles, as well as larger insects, such as grasshoppers. In North America the burrowing owl mating season begins at the end of March or beginning of April. The owls are typical monogamous. Unlike most raptors their is very little difference in size between male and female burrowing owls. When she begins to lay eggs the female will lay an egg every day or two. Since ground nesters typically more chicks to predation they often compensate by having larger clutch sizes. The average clutch size of the burrowing owl is 9 eggs only about half of which will survive long enough to leave the burrow. The chicks in the photo above are only days old. You can see that they are covered with down and their eyes have not opened. The shiny spot on the end of their beak is their egg tooth. This is that they used to crack the shell when they were ready to emerge from their eggs. When the chicks get a little older they will hiss when a potential predator tries to invade the den. The hissing sounds similar to a rattle snake and will often make potential predators think twice about continuing. Their are approximately 22 subspecies of burrowing owls, although their is very little difference between them. In the United States there are only two subspecies, hypugaea (northern burrowing owl) and floridana (Florida burrowing owl). The northern subspecies is found from southwestern Canada down through the western U.S. down into Mexico and Central America. The Florida subspecies is only found in Florida. One of the key differences between the two North America subspecies is that the Florida subspecies typically digs its on burrow. This is because there are not really any mammals in the range of the Florida subspecies that digs burrows that they could use. Fortunately the Florida subspecies live in parts of Florida where the soil is very fine sand. This allows them to use their long legs to kick out the loose sand. 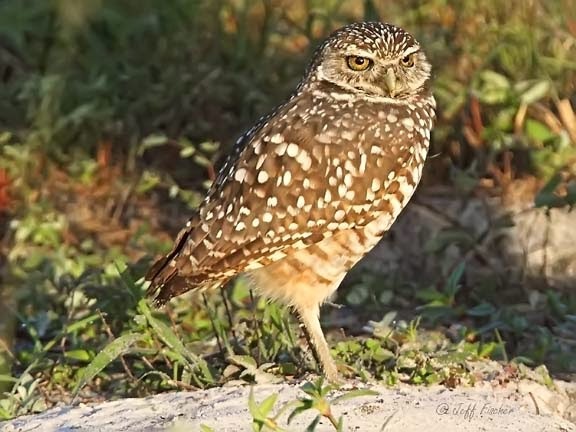 The first two photos are examples of the northern subspecies where the last photo is an example of a Florida burrowing owl. An outstanding entry and a fascinating bird. 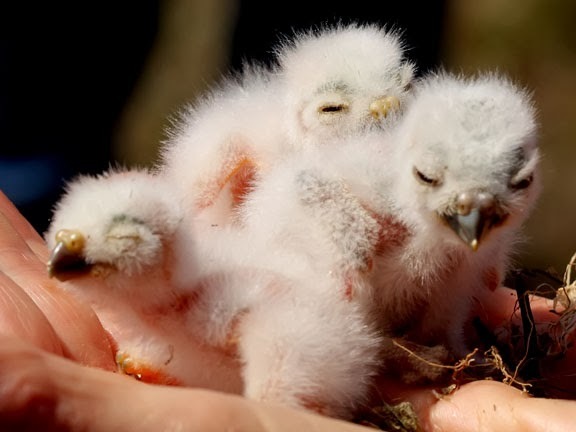 "B" Entry # 51: "I'm Batman"
Would NOT have recognized those as owl chicks. Fascinating to learn about this owl and great pictures. These babies are adorable. So white and fuzzy. The eyes on the adult are so piercing. Would not want to make him mad. First image is perfect, superb lighting, detail and background, and of course .... what a bird. It's good to learn more about a very cute bird that I'd love to see - thanks. What amazing photos and birds. We have nothing like this in New Zealand, though I think our Morepork is a similar size. Their long legs are so interesting and babies so cute.